Hillcrest Firethorn provides post-acute rehabilitation in Lincoln. Hillcrest Health Services offers years of experience providing best-in-class care for aging adults through our continuum of services. Recognized nationally for our leadership and innovation, we are now enhancing lives in the newest and most beautiful post-acute center in Lincoln. Hillcrest Firethorn is located on Firethorn Lane near 84th Street, and features a bistro that proudly serves Starbucks®. The Firethorn Bistro is open to the public daily from 8 a.m. to 2 p.m. Visit today! At Hillcrest Firethorn, we strive to provide a comfortable environment to suit the needs of our guests (patients). 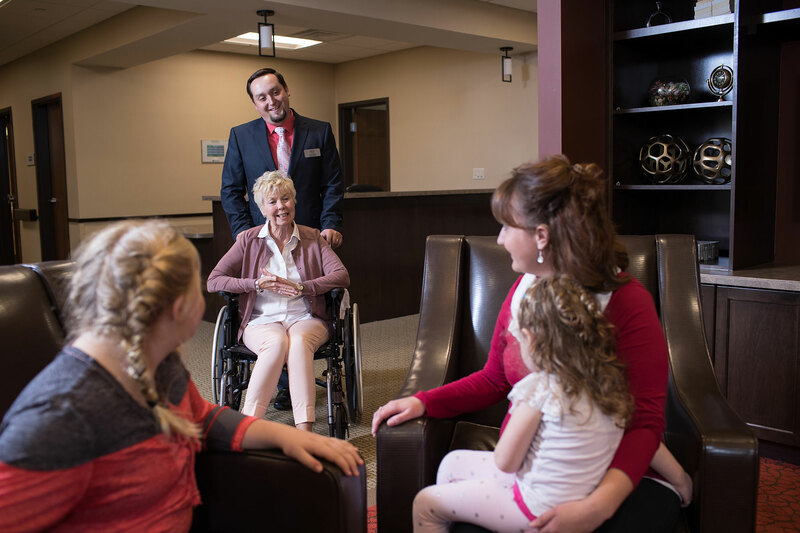 Our post-acute rehab center can serve 72 guests in two separate neighborhoods, each offering 36 upscale private suites. While our team is always focused on rehabilitation and therapy to make our guests well, we also truly value their independence. With fun gathering spaces for guests and their families, they can stay thoroughly entertained between therapy sessions if desired. Our calendar of events is full of activities to keep guests engaged and support their recovery efforts. Our culinary services are top-of-the-line, with an executive chef focused on hospitality that rivals a vacation resort. Our culinary team prepares made-to-order specialties that are unmatched in the health care setting. Guests can enjoy social interaction in our attractive restaurant or choose the comfort of in-room dining while recovering. See a sample menu for the Stonebridge Restaurant here. The Firethorn Bistro, proudly serving Starbucks® coffee and drinks, offers grab-and-go options or a casual environment to visit with family members. Hillcrest Firethorn also accepts long-term care residents who require 24-hour services. These residents can enjoy all of the amenities of Hillcrest Firethorn from the private rooms and bathrooms, to the made-to-order culinary program, to the full calendar of activities. 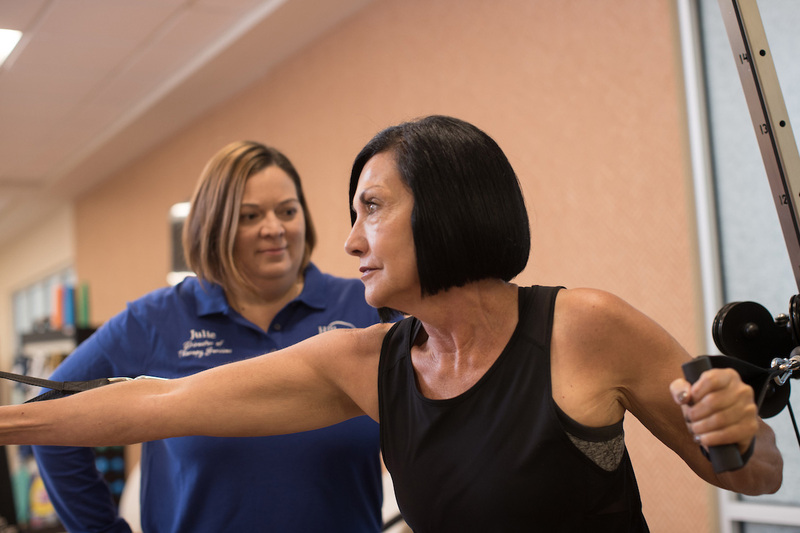 With 25+ years of experience in post-acute rehabilitation, we understand what it takes to help guests get back to their optimal level of function. We have our own team of therapists, not a contracted third-party therapy company, to provide guests with consistent and reliable care throughout their stay. With state-of-the-art therapy equipment, we provide innovative physical, occupational and speech therapy to help speed up recovery. Our entire team is focused on each guest’s recovery so they can return to their optimal level of function after transitioning to home or a lower level of care. Guests stay with us for an average of 14 to 20 days based on their physician-directed care plan. Medical care is overseen by our on-staff Chief Medical Officer Dr. Anthony Hatcher, who meets with guests at least twice per week. Hillcrest Firethorn also provides 13 specialty rooms, featuring piped-in oxygen for guests with cardiopulmonary diseases. As part of the rehabilitation process, we often transition guests home with Hillcrest Home Care. 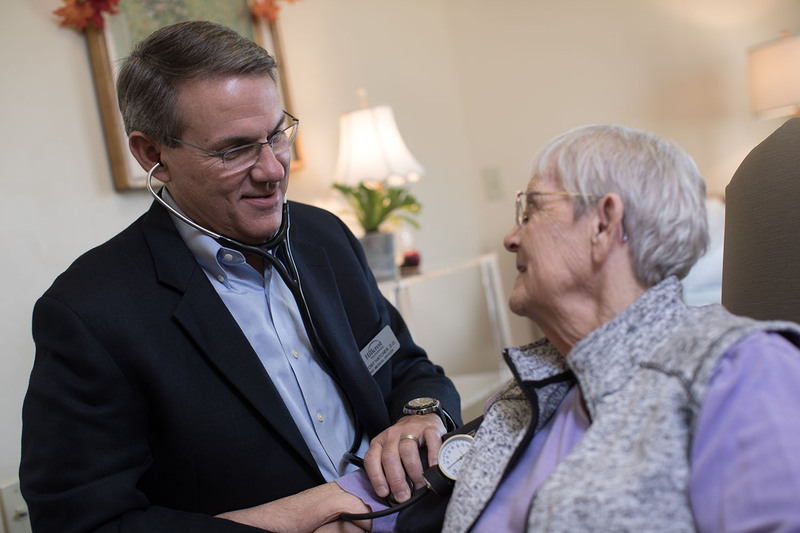 With the support of these skilled home health services, guests receive the additional nursing care and therapy they need to ensure a full recovery while avoiding an unnecessary rehospitalization. Click the button below to learn more about Hillcrest Home Care. For those who don’t require home health services, they may choose to return to Hillcrest Firethorn for outpatient therapy three days per week or as prescribed by their physician. Hillcrest Firethorn also accepts long-term care residents who require 24-hour services. These residents can enjoy all of the amenities of Hillcrest Firethorn from the private rooms and bathrooms, to the made-to-order culinary program, to the full calendar of activities.